The adorable upcycled Rainbow Twirly Skirt is made completely from repurposed t-shirts in excellent condition! The waistband is a high quality cotton/spandex that never stretches out. Twinkle Twirly Skirts can be worn all year round and are perfect over tights or a pair of leggings. They are colorful, comfortable and, best of all, super-twirly! I make lots of rainbow twirly skirts and since they're all recycled the shades of colors may vary slightly--but the color scheme is the same. 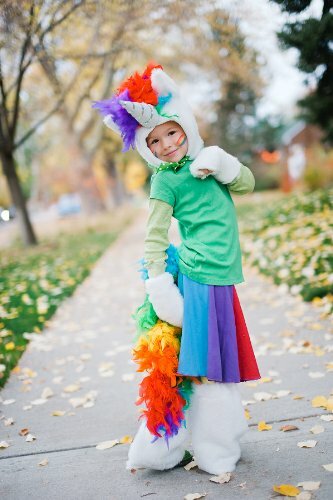 Unicorn costume is not included. This twirly will absolutely be your little one's favorite skirt! Sizing chart by waist size: 2T 15 inches 3T 16 inches 4T 17 inches 5 18 inches 6 19 inches 7 20 inches 8 22 inches These skirts are made to order so please allow 3 days prior to shipping.